This bench aid (English and French versions shown below) provides detailed instruction on the proper use of the new Filariasis Test Strip used for the detection of Wuchereria bancrofti antigen. Modules are grouped for training purposes. Source: WHO. Click on “Module 1: Background” below for example presentation. WHO Factsheet: Lymphatic Filariasis. WHO, 2018. The Preventive Chemotherapy (PC) Data Portal provides access to data from the WHO’s PCT Databank for 4 key indicators (Population Requiring Preventive Chemotherapy (PCT), Population Receiving PCT, Coverage, and Comparative Performance) across the 5 PCT NTDs (Lymphatic Filariasis, Onchocerciasis, Schistosomiasis, Soil-Transmitted Helminths, and Trachoma). 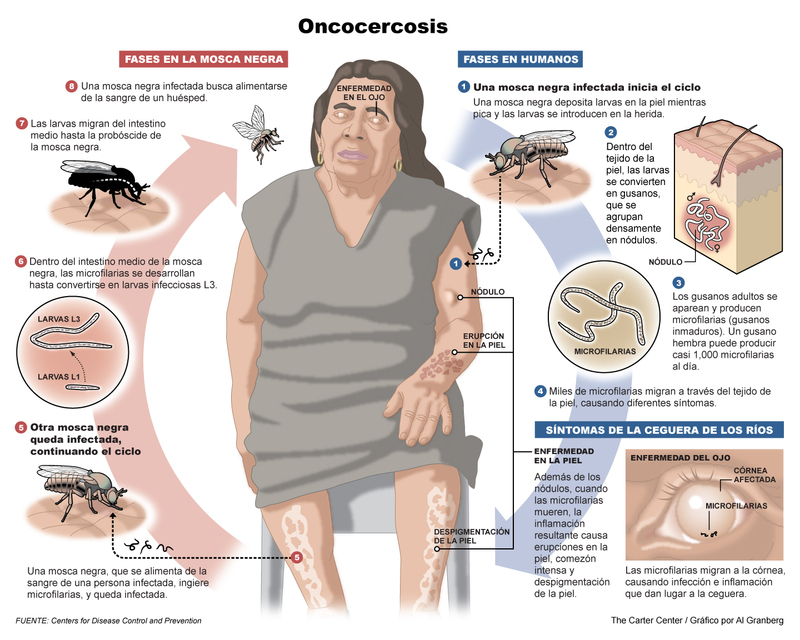 Oncocercosis: Fases en la mosca negra / Fases in humanos (En Espanol). Graphic: Al Granberg / The Carter Center. Source: CDC. 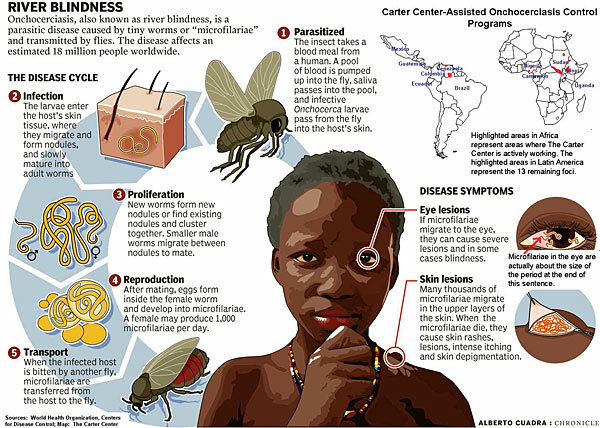 The Life Cycle of River Blindness. Graphic: Al Granberg / The Carter Center. Source: CDC. 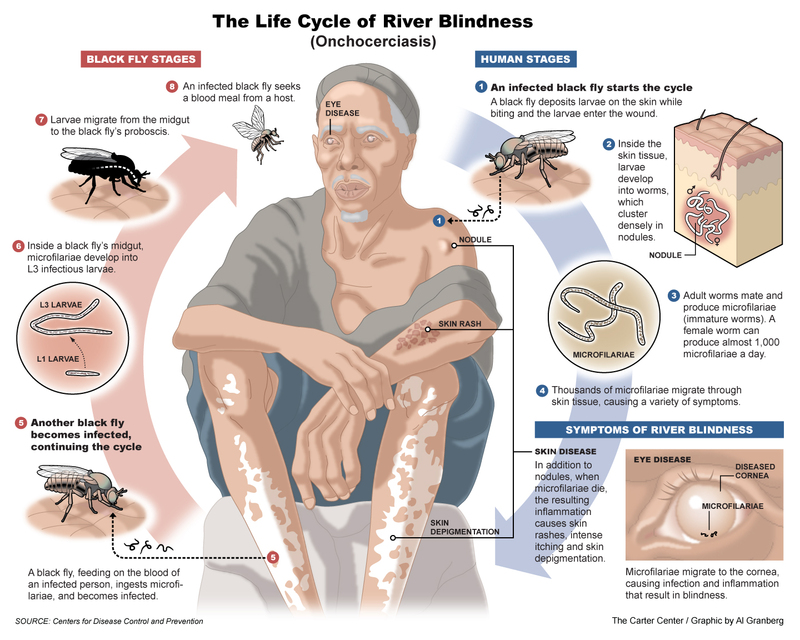 River Blindness Life Cycle. Sources: WHO/ CDC; Map:The Carter Center. Life Cycle of Lymphatic Filariasis. Source: CDC. Fourth in a series of five documentary videos exploring the history and impact of the Mectizan Donation Program. The PCT Databank presents historical data as reported to WHO. This tool is designed to empower users to leverage their familiarity with Excel and the simplicity of the Global Health Observatory (GHO) to rapidly construct summaries that can be shared as they are viewed. 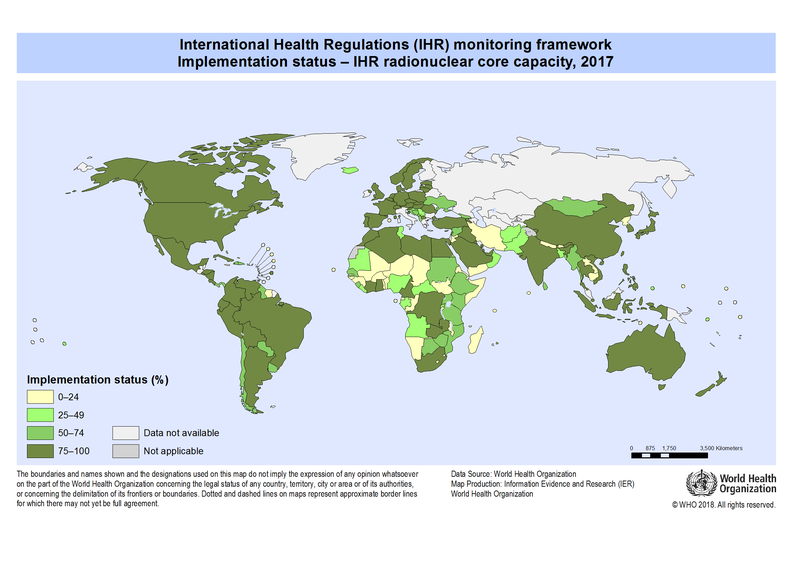 WHO Global Health Observatory Map Gallery: searchable database of maps illustrating burden of disease. Fifth and final in a series of five documentary videos exploring the history and impact of the Mectizan Donation Program. Enjoy this article on the billionth treatment for river blindness and lymphatic filariasis provided by Sightsavers and partners. The Carter Center and partners are working with Nigeria’s Ministry of Health to eliminate river blindness in nine of the country’s states, including Plateau, where Kisanchi is located. Article on the importance of cross-border issues in onchocerciasis elimination programmes. Bush, Sodahlon, Downs and Mackenzie, International Health, Volume 10, Issue suppl_1, 1 March 2018, Pages i54–i59. Article on the use of alternative (or complementary) treatment strategies (ATSs) to accelerate the elimination of onchocerciasis. Boussinesq et al., International Health, Volume 10, Issue suppl_1, 1 March 2018, Pages i40–i48. Article on eliminating onchocercias as a public health problem in Uganda. Katabarwa et al, International Health, Volume 10, Issue suppl_1, 1 March 2018, Pages i79–i88.